"Hitler's Shattered Dream of Dictatorship"
Adolf Hitler's dream of becoming dictator of Germany by legal means is said to have been "dissipated forever" as the results of the Reichstag election on November 7. For the first time since the Brown Shirts, led by their fiery and eloquent chief, leapt into world-wide prominence two years ago, The National Socialists (Fascist) party suffered a setback at the polls in the election of the seventh Reichstag of the German Republic. The Nazis. as they are familiarly known, polled 2,000,000 votes less than their high-water mark in the parliamentary election of July 31, and they will have 195 deputies in the new Reichstag as compared to the record number of 230 they registered in the old. The magazine furnishes the total deputies for fifteen parties and the popular vote for nine of these, although the precise numbers aren't important — and in fact the magazine has gotten the date wrong. The Nazis had the biggest decline of two million votes and 35 seats, followed by the Socialists; while the Nationalists and Communists gained seats. Hermann Goering had become President of the Reichstag on 30 August 1932 after the previous election and subsequent negotiations, and retained this office for the Nazi Party. Of these 582 Deputies, 416 belong to "Socialist" parties of one shade or another, 195 to the National Socialists, 121 to the Social Democrats, and 100 to the Communists. The fourth largest party, the Catholic Center party, which is represented by sixty-nine Deputies, also is influenced largely by its trades-union section. Elliott characterizes Alfred Hugenberg's Nationalist party as the only bourgeois political party that "has any considerable strength". This is the party of the monarchists in Germany. Most of the larger political parties were in principle if not always tactically hostile to the Weimar Republic as constituted. Practical: No party holds close to a stable parliamentary majority. Practical: No stable alliance of parties is likely to be formed to maintain such a majority. Principled: No party presents a clear value to vote for. This political mess after frequent elections in the late Weimar Republic forms a heavy weight in the balance against a system allowing a multiplicity of minority parties, all essentially at ideological loggerheads. With benefit of hindsight, we may look beyond the optimism of The Literary Digest, and of the world, at the end of 1932. The squabbling multiparty interlude was highly unstable and resulted in the single-party totalitarianism of the Nazi state, a disaster for Germany and the world. Less than three months after this last Weimar Republic election, on 30 January 1933 Adolf Hitler was appointed Chancellor of Germany. After 14 July 1934 the Nazi Party was the only legal political party. 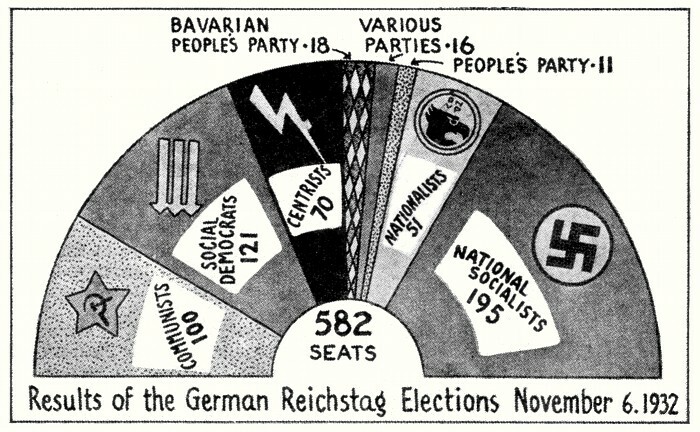 On 12 November 1934 the first election under the Third Reich thus readily provided the decisive pro-Nazi results that Hitler wished, 92 percent of the popular vote and an essentially all-Nazi slate in the Reichstag.